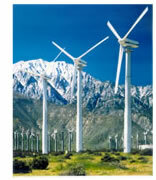 Wind turbines use the wind to produce electrical power. A turbine with fan blades is placed at the top of a tall tower. The towers are tall in order to harness the wind at a greater velocity, free of turbulence caused by interference from obstacles such as trees, hills and buildings. As the turbine rotates in the wind, a generator produces electrical power. A single wind turbine can range in size from a few kW for residential applications to more than 5 MW. The map below shows the installed wind capacity in megawatts. Generally, individual wind turbines are grouped into wind farms containing several turbines. Many wind farms are MW scale, ranging from a few MWs to tens of MWs. Wind farms or smaller wind projects may be connected directly to utility distribution systems. The larger wind farms are often connected to sub-transmission lines. The small-scale wind farms and individual units are typically defined as distributed generation. Residential systems (5-15 kW) are available; however, they are generally not suitable for urban or small-lot suburban homes due to large space requirements. Several companies are working to develop Stirling engine/solar dish hybrid systems. These kinds of hybrid systems are small, with typical outputs in the range of about 5 to 25 kW. This size makes dish/Stirling hybrids ideal for stand-alone or other decentralized applications, such as replacement of diesel generators. Larger dish/Stirling plants with outputs of 1 to 20 MW could be developed to meet moderate-scale grid-connected applications. Dish/Stirling hybrids can also be designed to run on fossil fuels for operation when there is no sunshine. Wind turbines can be used in combination with energy storage and some type of backup generation (i.e., reciprocating engine, turbine, or fuel cell) to provide steady power supply to remote locations not connected to the grid. Energy storage devices such as flywheels are being combined with reciprocating engines and microturbines to provide a reliable backup power supply. The energy storage device provides ride-through capability to enable the backup power supply to get started. In this way, electricity users can have an interruption-free backup power supply.